I was born sometime between the invention of Television, and the Internet. Originally I thought it was closer to the invention of the TV, but I've recently discovered that the first television was invented waay back in 1927 - so, booyah, I'm more of an internet baby! I grew up on a farm in South Australia. 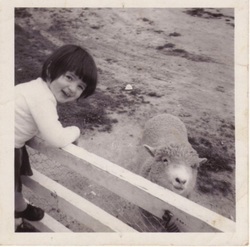 That's me on the left with my pet lamb, Mary. I had at least one pet lamb every lambing season, and they were all called Mary. I guess my creative streak didn't show itself until later in life! (Also, I obviously thought the nursery rhyme went... Mary WAS a little lamb, instead of Mary HAD a little lamb) Anyway, enough pointing out my childhood shortcomings! When I left school I got a job working in a bank, and for the next 18 years I worked with numbers in various accounting positions. It wasn't until many years later that I switched to working with words. One of the good things about working with words is, if you can't find the exact word you need, you can sometimes make one up! When you're working with numbers, and trying to make them balance, you can get into a whole lot of trouble for making one up! I've always hated cold weather, and loved reading, so winter time was mostly spent curled up in front of the heater with a book in my hands. One frosty winter's day when I was 25, I decided it was time to travel around Australia. A week later I jumped in my trusty car and headed north. My trusty car broke down when I got to Cairns, and by the time it was fixed I had fallen in love with the place, and decided to never leave! Now I live just north of Cairns, and I can read stretched out by the pool instead of huddled up inside. When I'm not writing or reading I enjoy swimming, running, cycling, camping, hiking and watching disaster movies.